Video capability. Although there is a separate video recording mode on the Sony A77, capture can still be initiated from any still-image mode by pressing the Movie button at top rear of the body. High-definition video capture is now a must-have feature in interchangeable-lens cameras, and essentially all the major manufacturers now provide some form of video capture in their compact system cameras. Sony's Translucent Mirror cameras offer a near-unique capability in this area: the ability to focus automatically using phase detection. With the exception of Nikon's 1-series cameras, all other interchangeable-lens models must focus solely using contrast detection. Post Sony SLT cameras have tempered this benefit somewhat, by lacking other features such as fully manual exposure control, but the Sony A77 has a pretty rich video feature set in other areas as well. Full HD is possible, and at an impressive 60 frames per second from real 60 fps sensor data. There's also a generous selection of frame rates available, at least at the highest resolution. Fully manual exposure control is available, both before and during recording, but there's a catch: all except Program autoexposure disable autofocus entirely, losing the main benefit of an SLT design for video, and you don't even have contrast-detect AF to fall back upon. On the plus side, though, you have both stereo audio from the internal microphone and from an external mic jack, and while the A77 doesn't offer manual audio levels control, there's a wind cut filter available. For its target customer, the few quirks are likely not of great importance, however. If you want to control exposure variables manually, you'll likely also want to lock focus or pull it manually, as well. A simple external audio recorder and a few minutes in post-processing would be enough to surmount the lack of manual levels control, if that's an issue. On balance, we think the feature set will prove pretty attractive even to many prosumers. The Sony A77 records at three different video resolutions, and can record high-definition movies in either AVCHD or MPEG-4 formats. Stereo audio is recorded during movie capture, encoded as Dolby Digital (AC-3) for AVCHD and AAC-LC for MPEG-4. No spec is provided for the sampling rate of the audio tracks, though video players report 48 kHz at 256 kbps for AVCHD and 48 kHz at 128 kbps for MPEG-4. The table below shows the specs for various video recording options. As noted above, the Sony A77 offers two video recording formats, either the HD-only AVCHD format or the less space-efficient but more computer-friendly MPEG-4. The MPEG-4 file format is a bit less efficient in its use of memory card space for a given image quality level, but is more widely supported, and seems to be a bit easier for older computers to read. AVCHD is the best choice if your primary output is going to be directly to a HD television, but MPEG-4 probably a better choice for your computer, particularly if it's more than a year or two old. In AVCHD mode, the pixel resolution is 1,920 x 1,080, with a choice of either progressive-scan or interlaced capture. Unlike almost all cameras to date, the Sony A77's 60fps modes are true; that is to say that they're recorded from data that's clocked off the sensor at 60 frames per second, not by simply repeating every frame twice for progressive scan, and splitting every frame across two fields for interlaced video. The highest 28Mbps bitrate is not surprisingly in the 60 frames-per-second progressive scan mode, and here you have no choice of lower bitrate. For interlaced video and lower 1080p frame rates, though, you have two choices of bit rate; either 24 Mbps, or 17Mbps. If your computer is up to the task, the 60p mode offers a worthwhile improvement in fluidity over cameras that clock data off at 30 fps. It also offers the ability to halve your playback rate for a 50% slow-mo, while retaining the same fluidity you'd obtain with most other SLRs. MPEG-4 mode offers a choice of two resolutions both recorded at 30 frames/second (progressive), with data rates and compression ratios as detailed in the table above. Note that the 1,440 x 1,080 pixel mode has rectangular pixels, meaning that it plays back with a standard 16:9 aspect ratio, but with reduced resolution on the horizontal axis. This less-common format hails from HDV camcorders. The A77 forgoes a 1,280 x 720 pixel mode altogether. wasn't a happy one, read "Real-world Video AF Performance" below for details. Live autofocus during video recording was traditionally one of the main areas in which SLRs and CSCs lagged dedicated camcorders, although modern contrast detection algorithms have done a lot to catch up. It's perhaps not as much of a problem as one might expect, anyway, because the lower resolution of video images results in greater effective depth of field than with high-resolution still images, but it's still proven an issue for many consumers. Arranging camera angles so the subject will stay in the plane of focus for the duration of a clip can help to some extent, as can using smaller apertures to increase the depth of field, but neither works in all situations, and provides an adequate replacement for live autofocus. Of course, you can also learn to "pull focus" while the camera is recording, moving between preset focus points manually, but doing that well requires a surprising level of skill and experience -- and it can be made even trickier with lenses that weren't designed for video use. The Translucent Mirror design of the Sony A77 allows a near-unique selling point: full-time phase detection autofocus during video capture. (Among interchangeable-lens models, only the other Translucent Mirror cameras and Nikon's 1-series cameras can make this claim.) The availability of full-time phase detect avoids the main drawbacks of contrast-detect AF: a tendency to hunt around the point of focus, and slower AF operation, although both aren't as much of an issue as they once were. Still, there's no question that consumers and some prosumers still consider the availability of phase detect for video to be a big plus. There are, however, some catches. Perhaps most significantly, the Sony A77's autofocus functionality during movies relies on the lens aperture being kept at or near the open position, and for this reason, manual or priority exposure control isn't available when autofocusing is enabled during movie recording. Since smaller apertures can't be used to control exposure, this further means that when autofocus is enabled, a combination of adjustments to ISO sensitivity and shutter speed must be used to control exposure in bright lighting. When higher shutter speeds are selected by the Sony A77's auto-exposure system, the result can be a noticeable choppiness, because each video frame retains less motion blur on moving subjects. (If you're intending to extract stills from your video, though, the reduced motion blur can potentially be an advantage, with moving subjects more sharply rendered.) This issue can be worked around using neutral density filters to bring the shutter speeds back down, but that of course relies on your having the appropriate selection of filters for your chosen lenses. The Sony A77's phase detection system functions identically for both still image and movie shooting. There are a total of 19 AF points, of which 11 are cross-type points, sensitive to both horizontal and vertical detail. While these points cover a fair portion of the image frame, and it's possible to manually select which point you want to use, they cannot be moved around the frame at will, as you can do with a camera using contrast detection autofocus. 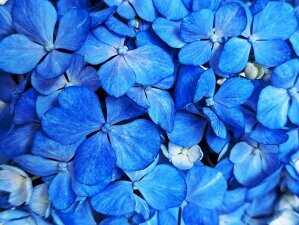 (They also don't reach as near to the edges of the frame as is possible on cameras using contrast detection.) Four AF point selection modes are available -- Wide (which automatically selects any of the 19 AF points), Zone (which allows automatic selection either on the left, right, or center of the frame), Spot (which uses only the central, cross-type point), and Local (which allows direct selection of any individual point). The focusing mode and point can be changed during movie capture, useful if your subject is moving around the frame, or you want to direct the viewer's attention between multiple subjects in the scene, but this does involve some handling noise that is likely to be picked up by the on-board mics. Regardless of the autofocus servo mode selected for still image capture, movies always use continuous servo autofocus, so it isn't possible to manually trigger single AF cycles as desired during movie capture. There is a workaround for this, in that you can simply disable and re-enable autofocus during movie recording, using the physical switch on the lens or camera body, as appropriate. Unless the camera's mounted on a tripod, though, this approach is liable to cause camera shake, and of course the sound of the switch being moved will also likely be picked up by the A77's internal microphone. Of course, it's also worth noting that noise from the autofocus drive mechanism is also likely to be picked up on the audio track, unless using an external microphone mounted remotely, or on some form of shock mount. For more advanced users, manual focus during video recording is certainly an option, just as it is on many video-capable, interchangeable-lens cameras--and unlike video-capable DSLRs, the A77 allows framing of video not only on its LCD display, but also in its electronic viewfinder (an important advantage when shooting under bright sunlight, when LCD panel glare can make manual focusing even more challenging). The Sony A77's very high resolution electronic viewfinder makes reasonably accurate manual focus adjustment more feasible than most, even without zooming the view. With that said, though, even though it's right at the upper end of what's available in terms of resolution, it doesn't provide even half the resolution of a Full HD video frame, so you'll likely find that the AF system can still do a noticeably better job of focusing than you can manually. The Sony A77 does offer its users a potential solution for any shortcomings in their manual focusing abilities, thanks to the availability of full manual or priority exposure control when focusing manually. Presuming that there's enough light for an adequate exposure, you can simply stop down the lens further to increase the available depth of field, giving yourself a margin of error around your selected point of focus. The availability of full-time phase detection autofocusing during movie capture remains one of the most significant benefits of the Sony A77's Translucent Mirror design, and while it doesn't provide quite the level of benefit for consumers that it did in its predecessors 18 months ago, you still can't understate the benefit of relatively fast autofocusing without obtrusive hunting. Since its Alpha-mount lenses weren't designed for video, autofocus drive noise is unfortunately quite noticeable, but that's an issue that the Sony A77 shares with most video-capable DSLRs. Probably the biggest issue in the design is the requirement that the lens aperture be held open when autofocus is active, which can result in choppy video when shooting in bright conditions. This, coupled with the inability to place a focus point outside the area covered by the phase detection AF points, are probably the most significant drawbacks of the design. Unfortunately, with the availability of full-time phase detection AF in the A77, Sony continues to choose not to provide any contrast detection AF capability. Given that both methods have different strengths and weaknesses, we'd still have preferred to see Sony offer both systems, allowing the videographer to decide which AF mode was best suited to their subject. The clips at the top of this section shows the Sony A77 trying to track a car moving at 10 mph and 20 mph, more or less directly towards the camera. After some initial failures, we thought that perhaps the lack of vertical detail in the car's grille could have been a problem (despite the A77's center AF point being cross-type), so we taped a large version of the focus target from our Indoor Portrait shot to the front of the car, to make sure the camera had something really easy to focus on. Unfortunately, this made no difference. You can see the AF behavior most clearly in the 10 mph clip at top, where the camera makes no focus adjustment until the car is quite close, then suddenly snaps into sharp focus and tracks for a little while until the car is just too close. As soon as the car moves off the center AF point again, focus very quickly shifts to the background. We performed this test at speeds ranging from 10 to 40 mph, across a couple of days, using first the 16-50mm kit lens, and then the 24-70mm f/2.8 Carl Zeiss optic. We thought that perhaps the better lens would improve the AF results, but they were actually somewhat worse. On some of the tests from the first day, the camera did a reasonable job of tracking, but only at 30 and 40 mph, 10 and 20 mph were as bad as seen above. We did our first set of tests using just Spot AF, but the next day tried both Spot and Wide Area, thinking that maybe the camera might do better if we gave it more freedom in where to find its subject-distance information. As you can see above in the second 20 mph example, this made no difference. What makes this all so puzzling is that the camera performed brilliantly when shooting in continuous still-frame mode, tracking focus very accurately across a range of speeds, until the car was very close to the camera and moving very quickly. Why did it do so well in those tests, but fail so miserably when shooting video? It's the same focus system at work in both situations, so you'd think the results would be the same. We unfortunately have no answer to the above; we used two different lens, gave the camera a very easy, brightly-lit target to focus on, and made sure we had the latest firmware loaded beforehand (v1.06, at the time). We have to believe that this is a fixable problem, given how incredibly well the camera did in continuous still mode with the same subject under identical conditions. We've asked Sony to look into this, and will post an update here once hear back from them. Shutter speed is one aspect of video exposure we've recently become more aware of. It turns out that slower shutter speeds tend to produce more natural-looking videos than faster ones: The motion blur associated with a slower shutter speed tends to smooth-out transitions between frames with rapidly-moving subjects: Cameras with 30fps recording, but shutter speeds 1/100 second or higher produce somewhat choppy, artificial-looking movie footage, while cameras with exposure curves biased toward shutter speeds in the 1/30 - 1/60 second range show a lot more motion blur, but the end result looks more natural to the eye. The A77 is more prone to this than traditional SLRs and CSCs, because when autofocus is enabled, the aperture must remain at or near its open position to make phase detection AF possible. This results in the exposure level being controlled with only shutter speed and ISO sensitivity, where other cameras might be able to use a slower shutter speed by stopping down the lens aperture as necessary. Sony is unique among camera manufacturers, in having both body-based and lens-based image stabilization technology in their product lines. In the case of the A77, image stabilization happens in the body, and so it is available with all lenses. Sony claims that the SteadyShot anti-shake system in the A77 provides a 2.5 to 4.5-stop reduction in the blurring produced by camera shake. Translating that into real-world shutter speeds, a two-stop improvement means that a shutter speed of 1/30 second would give you the same resistance to blur from camera shake that a speed of 1/120 would without anti-shake. A 4-stop improvement would mean you could shoot as slow as 1/6 second and get the same results (blur-wise) as when shooting at 1/120 second unaided. Even the lower end of the specified range of effectiveness means a pretty significant improvement in one's ability to hand-hold long exposures. Since the A77 uses sensor data to provide a live view feed on the LCD display or electronic viewfinder during video capture, the effect of stabilization can be monitored. External Mic. The Sony A77's optional external stereo mic plugs into a standard 3.5mm jack under a rubber flap on the left side of the camera body. Like most competing SLR cameras with video recording capability these days, the Sony A77 features a built-in stereo microphone, but with very little separation between the microphone ports (both housed under a single grille right in front of the flash hot shoe), a position that likely reduces the stereo effect. It also provides for recording via an external stereo microphone, courtesy of a standard 3.5mm jack located under a rubber flap on the left side of the camera body, a less common feature. Sony's only published spec for the A77's audio recording capability simply says "Dolby Digital / MPEG-4 AAC-LC", so we don't officially know the sampling rate or number of bits of A/D resolution employed, although third-party MPEG players suggest 48 kHz at 256 kbps for AVCHD and 48 kHz at 128 kbps for MPEG-4. As with with most video-capable SLR and compact system cameras we've tested, the A77's internal microphones are exquisitely sensitive to noise produced when operating the camera's controls or even moving your hands on the body. Since the A77 accepts standard Alpha-mount lenses which haven't been designed with video recording in mind, autofocus drive noise is also clearly picked up by the camera's internal microphones, although the AF operations are at least brief and direct, perhaps resulting in somewhat less noise than in cameras using contrast detection autofocus. As with most video-capable interchangeable lens cameras, the Sony A77 doesn't have any provision for manual audio level control, whether working from the internal or optional external mic. Of course, this isn't likely to be an issue for the A77's primary target buyers. It does, however, provide a simple on/off wind cut filter function. The A77 is rare indeed as an interchangeable-lens camera with a built-in GPS receiver. As in still image mode, the A77 can geotag its movies with their capture location -- or at least, with the location at which capture commenced. This information can be displayed on the camera's screen, and accessed by Sony's bundled software. The GPS can take several minutes to achieve its initial lock, but this process can be made faster by uploading GPS assist data from an attached computer using Sony's software package around once per month. The Sony A77 makes movie recording very easy, as you can initiate it at any time, regardless of the mode-dial setting: Simply press the prominent Movie Record button with the red dot at its center on the camera's top panel, and the camera will start recording video. Of course, if you want to record with manual exposure control, you can jump to the dedicated Movie position, so you get the best of both worlds--quick access while shooting stills, but total control when needed. Playback mode on the Sony A77 is--as in other recent Sony interchangeable-lens cameras--decidedly odd. The reason is that the A77's playback is an either/or (well, either/either/or) proposition, relative to stills and videos: If you've just shot a video and press the playback button, you'll see only movies that are stored on the card; not the still images. (And for that matter, only videos recorded with the same compression type you last used.) Likewise, if you've just shot a still image, you'll only see other stills when you hit the playback button. To switch between the still, MP4, and AVCHD playback modes, you have three options -- either drop into thumbnail view and scroll over to the left, then press the four-way controller to get the View Mode selection screen, or visit the Playback menu and access the View Mode menu there, or simply grab a throwaway exposure of the type you want to view. We actually found it much more convenient to hit the Movie Record button twice (to record a brief video clip) than to navigate through the playback menu to change the playback mode. The likely reason for this odd either/or choice for movie/still playback reveals itself when you try to scroll through movies you've recorded, to find a particular one you want to play back: Scrolling through recorded movies is just ineffably slow. Well, perhaps not ineffably; it's a matter of a couple of a second or two per movie, but that's slow enough to make navigating through more than two or three movies seriously painful. Why so slow? The camera is lightning-quick scrolling through still images, and doesn't it save a JPEG thumbnail of each movie, for just this purpose? This is another area in common with the NEX-series cameras that's going to produce a lot of frustration with users. While it pales beside the slow playback scrolling, we missed one other playback option that's utterly commonplace on both digicams and CSCs from most manufacturers; namely the "trim" function. Whenever you record a short video clip, it's inevitable that you'll start earlier and keep recording longer than the action you're interested in. (If you don't do this, you're almost certainly going to miss action you're interested in, especially because the Sony A77 takes a second or two to actually start recording, after you press the Movie button, even if it's specifically in Movie mode.) While "padding" like this is important and necessary, we like to keep our videos concise by trimming away the extraneous material at the beginning or end of the clip after they're recorded. Many cameras support doing this in-camera these days, but the A77 does not. You could certainly import the video clips to your computer and do the trimming there, but that's awfully cumbersome. Far easier to simply trim and toss away the unwanted footage on the camera. Essentially every video capable digital SLR/SLD currently on the market exhibits some level of motion-related distortion called rolling shutter artifacts. These are caused because the image data is captured and then read off the chip sequentially by rows, rather than each frame's data being captured all at once. In the case of the Sony A77, this means that image data for the last row of a given frame is captured and read out anywhere from 1/25th to 1/60th second after the data for the top row was captured. The effect on moving objects is like that of a focal plane shutter in an SLR, but more pronounced, because the video frame is read out much more slowly than the slit of a focal plane shutter moves across the sensor. A typical computer these days has little trouble dealing with still images, but high-definition video can be another matter. Depending on the file format involved, it can take a pretty beefy computer to handle HD-resolution video playback without stuttering or dropping frames. The Sony A77 supports both AVCHD and MPEG-4 recording formats, but the choice is dictated for you by resolution. 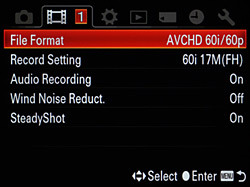 The AVCHD format used at the highest resolution is slightly more space-efficient on the memory card, and displays well on HD television sets, but is one of the more compute-intensive formats, and its 1,920 x 1,080 (1080p) resolution with, potentially, a 60 frames per second capture rate means there's a lot of data to deal with. The net result is that you'll want a recent, powerful computer to play full-res, 60p high-def video files from the A77 on your computer. At lower frame rates, and for lower resolution MPEG-4 video, the requirements will be somewhat more modest. You can, of course, view your movies on an HDTV via the HDMI output.